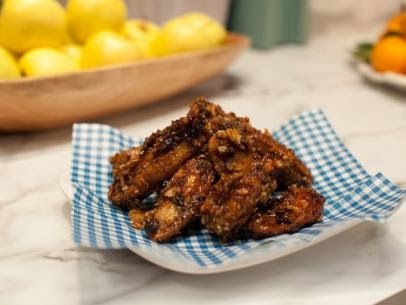 One of my favorite things to make on Game Day is Hot Wings (actually Hot Drummettes for me) but I am always looking for ways to change things up so I came across a couple of ideas that looked uniquely delicious for this upcoming Super Bowl Weekend! (Go Broncos!) Also, this would be a great appetizer to celebrate today’s Chinese New Year! My first inspiration came from a new show on the Food Network on Saturday mornings (in a previous blog, I explained my obsession with this network and especially on weekend mornings) called The Kitchen. One of the hosts did an Asian version of the wings but what caught my eye was that she used French Fried Onions as the crunch. I knew I had to try it! One confession I must make is that I actually do not like the “wing” part of the chicken so I used drummettes because they are much meatier and tender for my tastes. Other than that, I didn’t change a thing! Put the wings on a baking sheet and season both sides with salt and pepper. Let stand at least 30 minutes and up to 2 hours. To make the sauce, in a small saucepan, mix together the hoisin, pomegranate juice, brown sugar, garlic, horseradish, scallions, and a few grinds of black pepper. Cook, stirring, over medium-high heat. When the sauce starts to boil, reduce the heat to a simmer and cook until thickened, about 20 minutes. Fry the wings until golden brown, 12 to 14 minutes. Drain on paper towels. Put some of the sauce in a large mixing bowl and toss the wings in batches, adding more sauce as needed, until completely coated. Put the onions into another large bowl, add the sauced wings in batches and toss to thoroughly coat. Serve warm. Bottom Line: I loved these and will be serving them along with my traditional style recipe!